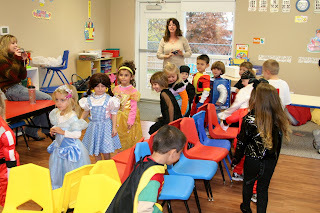 Ben's school had a party today and the kids had a blast. Last night we took Ben to 'safe night' at one of the high schools. 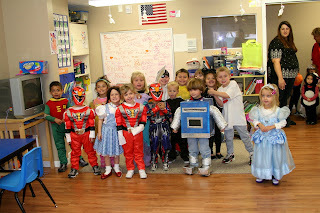 He entered the costume contest and one the 4-6 age group for "most original". We had left the gym and I was standing at the door waiting for Ben and Pete to return from the bathroom and people were still talking about THE Robot... kinda funny. 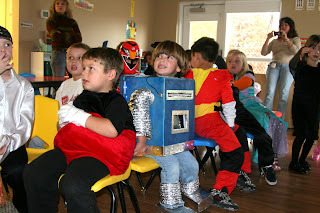 As we walked around the trick-or-treat lane (halls).. People were commenting with "wow dad must be a computer programmer" or "wow dad must be an electrician" but mostly we heard "That's an incredible costume." The majority of people just dont make costumes anymore I guess... too bad - it was really fun working WITH Ben to do his this year. 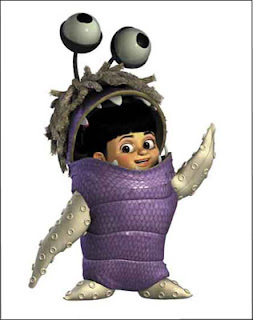 My favorite costume was a 2 yr old that her mom made her "Boo" from the movie Monsters Inc. It was absolutely incredible. She had the perfect brown hair in pig tails and just so cute. Unfortunately I think it was too good and the 'judges' didn't get it.. so she didn't win.